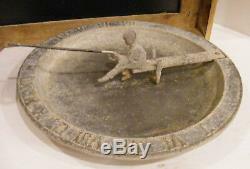 Antique Vintage fabulous GARDEN SUNDIAL!!! 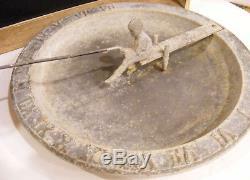 Sundial is created from a heavy bronze material but has patina'd to grey colors. 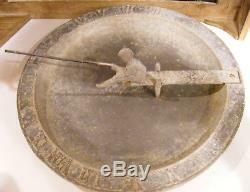 May have been used as a birdbath, but it is so unusual & wonderful. Boy is Fishing & the dial is actually him & his fishing Pole. 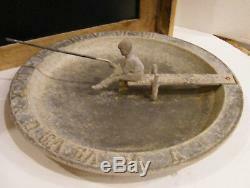 This is a wonderful Unusual & one of a kind Sundial. It is a beauty &very sweet Unique & quite wonderful!! 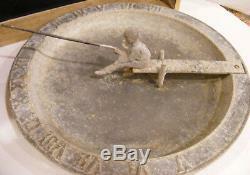 The Dial is made out of a metal possibly brass or bronze that has patina'd & is a very old piece & has long patina'd to almost a cement color by years & use. The interior of the dial is concave as it should be & the 1 1/8edges around the edge show repousse roman numerals. The boy is holding a fishing pole-- this piece is heavy. Dial measures 12.25 diameter. But the boy & his pole measures almost 4 tall. It is wonderful piece & unique. There is an area on the underside extending for insertion into a post or set on a base. 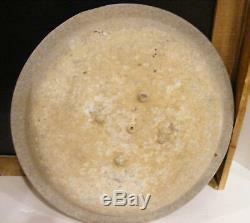 So it could be attached to a base or set upon a table. You will receive what you see in the pictures below. 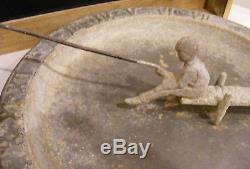 The item "Antique Vtg GARDEN Metal SUNDIAL SCULPTURE Boy & Fishing Pole Patina'd birdbath" is in sale since Tuesday, February 5, 2019. 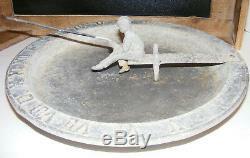 This item is in the category "Home & Garden\Yard, Garden & Outdoor Living\Garden Décor\Sundials". The seller is "sunniestsunshine" and is located in Prescott Valley, Arizona. This item can be shipped to United States.